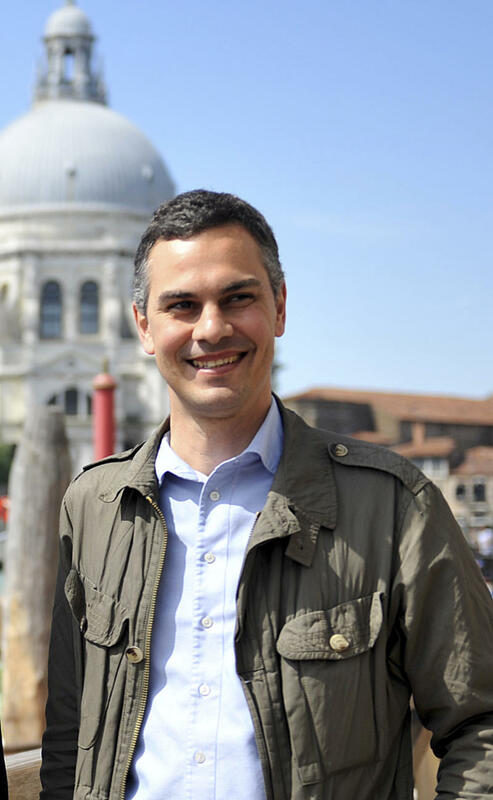 VENICE, Italy (AP) -- Massimiliano Gioni is the youngest curator ever at the world's oldest contemporary art fair — the Venice Biennale. Yet it is not just youth that gives the 39-year-old an edge as he presents the main show of the prestigious event that can make or break artistic careers. More importantly, Gioni says, he offers a unique outlook that comes with experience curating shows around the world. "I am not a spokesperson for my generation. ... If with youth comes innovation, I am happy," Gioni said in an interview, while adding: "Youth for the sake of youth is always a way to brand products." The Venice Biennale is Gioni's fifth but his first curating the main exhibit. It's the culmination of a rich itinerant course that has taken him from Berlin to South Korea and has allowed Gioni, an Italian who has spent most of his career in New York, to see the world as both an insider and outsider — distinctions his show both explores and challenges. "I wanted to think of artists both as self-taught and as professional, as famous and not famous, as people who can teach us something to see things," said Gioni, a critic and curator who is associate director of the New Museum in New York and artistic director of the Trussardi Foundation in Milan. "If you just stick to the masters and professionals," he said, "you sort of frame art as visual entertainment. I wanted to see art as it is, as a matter of life or death." He says he wants to celebrate the artistic renegades, many without any formal training, who have staked their lives toiling in obscurity: "Many of these outsider artists, they devoted their life to a project even when nobody cared about it. It is an example of obsession and obstinacy." Gioni took the title of the show, "The Encyclopedic Palace," from an elaborate 1955 proposal by self-taught Italian-American artist Marino Auriti to build an imaginary museum intended to house all knowledge over 16 blocks in Washington, D.C. Though his dream, filed with the U.S. Patent Office, was never realized, Auriti typifies the sort "illustrious nobody" and "dilettante" that Gioni wants to draw attention to through the exhibition. The curator stressed that the exhibit, which features 158 artists, would not be "the top 100 artists, the most prominent artists, and not a top 10, a who's who." The show opens with a legendary name that is not normally associated with the art world: Carl Gustav Jung — the father of analytical psychology. Jung's "The Red Book" — an elaborately illustrated manuscript made over 16 years that catalogues his visions — is displayed in a round glass case in the center of the rotunda in the biennale's main pavilion. Gioni says the exhibit is also a celebration of the books Auriti wanted to gather — objects the curator called "fetish and a space for the imagination." "I love books," said Gioni. "I still refused to move on to digital books. Maybe that is what this exhibit is about." The exhibit shows masters alongside untrained artists, and Gioni said he wants the lines between them to be blurred to "question the distinctions." "The Encyclopedic Palace" meanders from Shaker folk art to intricate, kaleidoscopic interpretations of the universe by French miner Augustin Lesage, borrowed from Art Brut collection in Lausanne, Switzerland. It includes a collection of model buildings made by Austrian insurance clerk Peter Fritz, which the catalog says provide "a near-encyclopedic inventory of all manner of provincial architectural styles." Nearby, there are works by Steven McQueen, Bruce Naumann and Richard Serra, among other established artists, and a curatorial project by Cindy Sherman, who created an imaginary museum. Gioni said Venice itself encapsulates the themes of his exhibit. "Whoever had the idea of doing one of the largest exhibits on earth in a city full of water was a dreamer," he said. Beyond Gioni's exhibit, the 55th Venice Biennale features national pavilions from 88 countries, 10 of those for the first time including the Vatican. Though there is no official theme uniting the pavilions, several ideas are gaining currency in this edition, which runs through Nov. 24. Artists are railing against greed and avarice, while also examining the results of collective actions. They are also pushing the boundaries, literally, of the physical world, altering the pavilions to incorporate the exhibit space into the art. Video and sound art also have central roles. Top prizes at the biennale are announced on Saturday.